In order to join a presentation, your attendee must download the BeyondTrust presentation app from the Apple App Store. The BeyondTrust presentation client is supported on iPad®, iPhone®, and iPod touch® devices running Apple iOS 8.0 and higher. The attendee will be prompted to enter a site address. This is the web address of your BeyondTrust public site. The attendee can then enter a session key or select a presentation from the list. The session key is generated when the presentation is created and can be found in the presentation schedule or in the active presentation interface. The presenter can provide this session key to the attendee verbally or via email. To select a presentation from the list, your public site must be configured to show a presentation list. Additionally, the presentation must be started and must have the Showing on Public List box checked. When the customer taps the Refresh button, the available presentations are listed. The attendee must then select the presentation and tap the Action button to the right of the selected presentation. Your administrator can determine which messages your attendee sees, if any, before the presentation begins. Messages that may be displayed include an attendee agreement and a greeting. If no one is available to give the presentation, an orphaned presentation message may also be displayed. 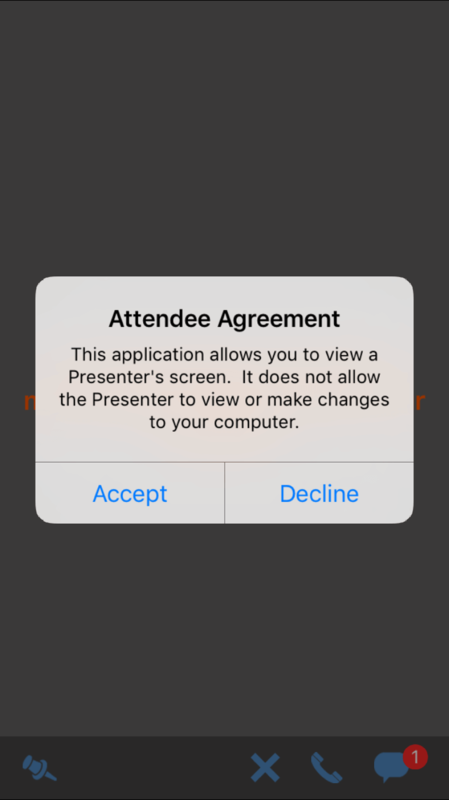 Additionally, certain non-customizable messages appear when the presentation has not started, when screen sharing is paused, and when the presentation has finished. Tap the Pin button to pin the toolbar in place. If unpinned, the toolbar at the bottom of the screen will disappear after a few seconds. Tap the screen to show or hide the toolbar. The attendee can pinch to zoom during the presentation. To view conference details, the attendee can tap the Details button. 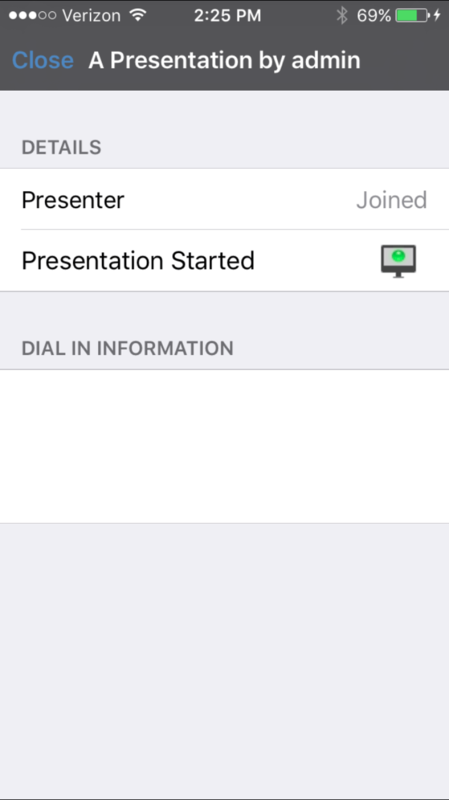 This will show the presentation name, the presenter's status, and dial-in information. If your attendee is on a phone which is capable of simultaneous voice and data or which is using Wi-Fi for its data connection, they can tap the phone number to initiate a call. To leave the presentation, the attendee can tap the Close button. If the presentation is still in progress, the attendee will be prompted to confirm that they want to leave the presentation. If the presenter ends the session, the attendee will see a message indicating that the presentation has ended. The presentation client app stays installed so that the attendee can access future presentations.